The Workplace ISA – Too Much Choice? 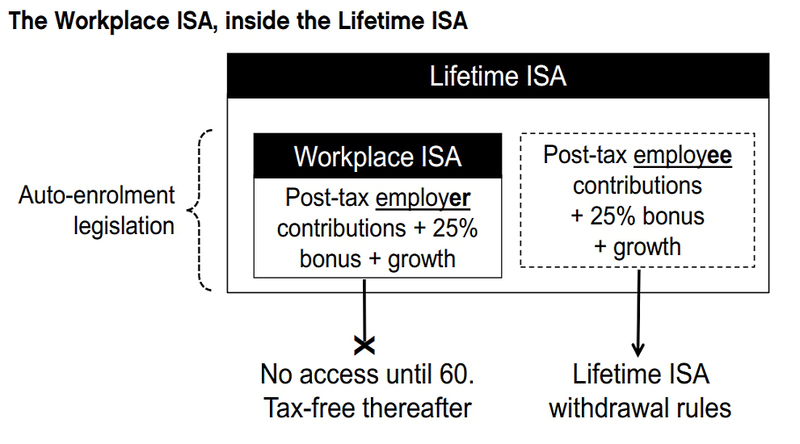 Today’s post is about the Workplace ISA, which the Centre for Policy Studies research fellow Michael Johnson has proposed as a stablemate to the recently announced Lifetime ISA. We’ve met Michael and the CPS before. He writes a lot of policy documents about pensions and savings – some good, some less so, but usually worth discussing. 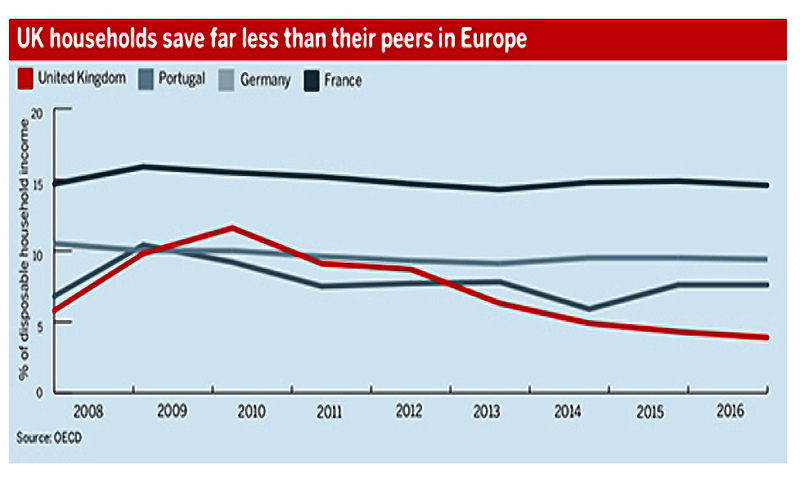 Michael is concerned that the population aren’t saving enough, and he has a graph to prove it. He wants to create “the broad-based savings culture that the UK so desperately needs. The majority of the population should be encouraged to set themselves one simple goal at the point of retirement: to be a debt-free home owner (including no consumer debt). I can certainly get behind that. Michael wants to introduce a Workplace ISA (WISA) alongside the recently announced Lifetime ISA (LISA). He also wants to bring both of these new ISAs inside the workplace auto-enrolment (AE) framework, to reduce the opt-out level. Finally, he wants a WISA to be provided via NEST for the 23% of employees, and 50% of the working age population, for whom a workplace pension is not available. This means that no employer sponsor would be needed to open a WISA with NEST, but without employer contributions, I don’t see the point. This apparent “control” is likely to be motivating to many workers. The thinking is also that the additional flexibility (ie. increased access to funds before retirement age) of the LISA and WISA would mean that fewer people would opt-out. AE Opt-out rates are low at the moment (10%), but employee contributions are also low (1%, or 0.8% net of 20% tax relief). There is also the issue of “non-active” members – who opted in at first, then stopped paying. These figures are not reported at present. As contributions rise – and to adequately provide for retirement, they will have to rise beyond the 3% + 5% of 2019 – more opt-outs are expected. And as things stand, the LISA will compete with AE pensions for employee (EE) contributions. If the early access features of the LISA prove popular, AE pension opt-out rates will increase. Note that most pension professionals don’t believe that this will happen – but they would say that, wouldn’t they. Michael wants to restrict the WISA to 18- to 40-year-olds, as with the LISA. Contributions can then be made to age 50. Withdrawals (tax-free, as per an ISA) can’t be made until age 60 (five years later than a SIPP, but the normal withdrawal age for a workplace pension). EE and ER contributions would be capped at £10K pa for the combined WISA and LISA (the LISA is capped at net £4K pa presently). This proposed cap doesn’t appear to include AE pensions. Employer contributions to a WISA would be taxed at the employee’s (EE’s) marginal rate on the way in (as per a regular ISA). Since they only receive a 25% top up (equivalent to 20% tax relief), this means that the WISA doesn’t attract 40% tax relief as does a workplace pension. Michael wants the NIC relief on employer (ER) pension contributions to be converted to a 25% bonus into the WISA. WISAs would be treated as pensions currently are for inheritance tax and means-testing purposes. Employers contribute 70% of the £100 bn put into workplace and personal pensions in 2015. But they complain that pension contributions are undervalued by employees. Employers also receive NIC relief on their £69 bn pension contributions, to the tune of £13.8 bn in 2015. Since employee pension contributions don’t receive NIC relief, many workers use “salary sacrifice” to reduce their salary and receive increased employee contributions (which do receive NIC relief). Michael includes a worked example in his paper. 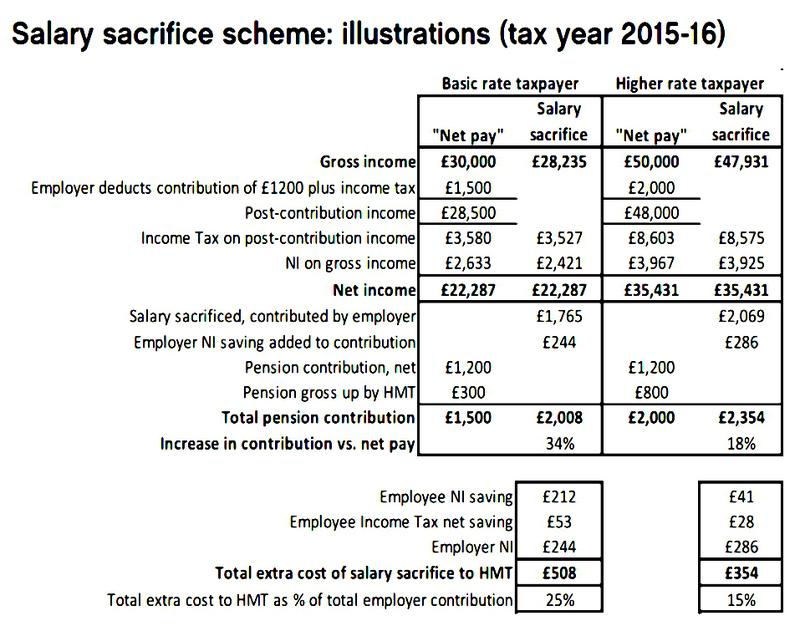 Salary sacrifice costs between £1.3 bn and £4.1 bn (30% of total employer NIC relief) – probably closer to the smaller figure. However, the recent budget confirmed that pension savings should benefit from NIC relief, even through salary sacrifice. Michael recommends the “conversion” of ER NIC savings into the bonus implies the employer paying for the bonus. This is an additional employment tax and would also effectively kill off salary sacrifice. Michael quotes surveys and statistics to show that people prefer to contribute to an ISA rather than a pension. That’s quite believable, if wrong in the long-term, but the issue is access. The LISA and WISA offer limited access before age 60. So willingness to contribute to a WISA is likely to be somewhere between an ISA and a SIPP, and possibly even lower than for both. Michael’s idea hasn’t gone down too well with the industry. But at the same time, I can’t help feeling that the pensions industry was bound to criticise an idea like this. They’ve only just stopped complaining about the LISA as a competitor to their beloved pensions. The real problem is that ISAs are generally cheap to operate, and the more money that goes into them, the less ends up with the pension companies and with IFAs. I can’t even open a LISA or a WISA, so I’ve got no axe to grind here. I also think that pensions are in general a better savings vehicle than ISAs. But for some young people, LISAs and WISAs would be useful. After a decade of simplification starting with A-Day in 2006, retirement planning seems to be getting more complicated again. Until this year’s budget, most of us could use a “four-pot solution“. For those of us of a certain age, a fifth pot of DB pension payments needed to be added to the DC workplace pension. For those under 40, the budget added an alternate fifth pot – the LISA, which is a hybrid ISA / SIPP. Now Michael would like to add a sixth pot – the WISA, which is a hybrid ISA / workplace pension. Since they can’t be accessed without penalty before age 60, the LISA and WISA add nothing to this solution. Between them, the cover the various tax treatments, and the annual contribution limits of £55K are more than adequate for all but the richest. But people can’t be trusted, and so we have these complications. It’s probably true as Michael says that those on moderate incomes respond more to AE schemes than to tax incentives. That makes AE membership worth preserving, and the WISA – together with including the LISA within AE – is clearly designed to do that. But if that’s the objective, why not just leap to the end game, and add compulsory contributions at a high rate (15%+) to all employment income – something like the “Super” system they use in Australia? The WISA is – like the LISA – fine as far as it goes. I have little sympathy for those in the pensions industry worried that the LISA and WISA would kill their golden goose. I do understand why Michael worries that the LISA will encourage more people to opt out of their AE workplace pension, and I agree that would be a bad thing in the long run. But even if the WISA was brought in, and the LISA added to the AE regime, the increasing complexity of the pensions system means than many workers will not be impressed, and may not do the right thing. 7 Circles > Costs & Taxes > Taxes > The Workplace ISA – Too Much Choice?